Having been seen off at the start line by parents, site manager Mrs Mimi Owen and Launceston College MAT staff Mr Dave Egford, Mr Bryan Maywood, Mrs Lynsey Slater and their pet dogs, plus other well -wishers in the crowd who had rushed from the Ten Tors start, Mr Jack Jackson (principal) and Mr Andy Barclay (Cornwall Outdoors), Mrs Caroline Reade, Miss Harriet Hunter LC TT staff, Kirstie Whittington 11 CB successfully achieved her gold medal by walking the JC 3 route in the 2017 Jubilee Challenge. With her ‘trainer’ Max Harmer 13PM, just behind her, Kirstie ran across the finish line with her mum Tracey, to be greeted by dad Garry and Max’s parents Martin and Kate. Supporters Mrs Penny Jackson (with a bag of homemade biscuits for the team), Mr Mrs Pett, Mrs Caroline Reade, who was managing the 3 Ten Tors teams, Mr Paul Oliver and Mrs Owen were all on hand to congratulate the intrepid pair. This was a substantial achievement by Kirstie who has trained with Carol Unwin (Outdoor Learning) for the past 3 years (Max for 6 years). Both students are due to leave College this year are on the threshold of their adult lives. Kirstie with GCSE exams looming and ‘Leavers Day’ to look forward to. Mr Harmer particularly wanted to express his gratitude to Carol for the opportunities afforded to Max in Outdoor Learning , which have contributed hugely to Max’s development as a young adult, something for which the College should feel highly proud. Kirstie and Max were accompanied by Carol Unwin and Matt Mitcheson. 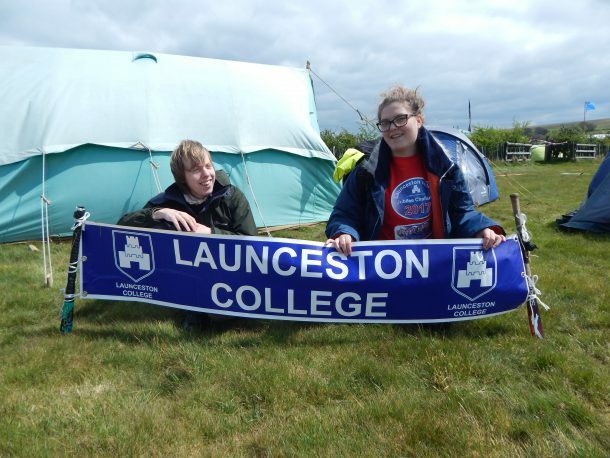 Both experienced Launceston staff, who ‘live the outdoor life’ and who themselves, recognize the value that outdoor learning can add to the human experience and who for many years now have promoted it as part of the many opportunities that College has to offer its students.